At the period of Captain Cook’s arrival (1778-1779), the Hawaiian Islands were divided into four kingdoms: (1) the island of Hawaiʻi under the rule of Kalaniʻōpuʻu, who also had possession of the Hāna district of east Maui; (2) Maui (except the Hāna district,) Molokaʻi, Lānaʻi and Kahoʻolawe, ruled by Kahekili; (3) Oʻahu, under the rule of Kahahana; and (4) Kauaʻi and Niʻihau, Kamakahelei was ruler. Following Kalaniʻōpuʻu’s death in 1782, the Hawaiʻi Island kingship was inherited by his son Kīwalaʻō; Kamehameha (Kīwalaʻō’s cousin) was given guardianship of the Hawaiian god of war, Kūkaʻilimoku. Dissatisfied with subsequent redistricting of the lands by district chiefs, civil war ensued between Kīwalaʻō’s forces and the various chiefs under the leadership of Kamehameha. Back on Maui, Kahekili prepared for an invasion against Oʻahu and Kahahana. He landed at Waikīkī in the beginning of 1783. Kahekili, dividing his forces in three columns, marched from Waikīkī by Pūowaina (Punchbowl,) Pauoa and Kapena to battle Kahahana and his forces. Kahahana’s army was routed, and he and his wife fled to the mountains. For nearly two years or more they wandered over the mountains, secretly aided, fed and clothed by his supporters. Kahekili’s warriors finally found and killed Kahahana. Helping Kamehameha were foreigners, John Young and Isaac Davis. John Young, a boatswain on the British fur trading vessel, Eleanora, had been stranded on the Island of Hawai‘i in 1790. Because of his knowledge of European warfare, Young is said to have trained Kamehameha and his men in the use of muskets and cannons. Isaac Davis arrived in Hawaii in 1790 as the sole survivor of the massacre of the crew of The Fair American. Davis also brought western military knowledge; Young and Davis fought alongside Kamehameha in his battles. Kahekili’s brother, Kamehamehanui (uncle to Kamehameha I,) lost Hāna, which was isolated from the rest of Maui. Kamehameha then landed at Kahului and marched on to Wailuku, where Kalanikūpule waited for him. The ensuing battle was one of the hardest contested on Hawaiian record. The battle started in Wailuku and then headed up ‘l̄ao Valley – the Maui defenders being continually driven farther up the valley. Kamehameha’s superiority in the number and use of the newly acquired weapons and canon (called Lopaka) from the ‘Fair American’ (used for the first time in battle, with the assistance from Young and Davis) finally won the decisive battle at ‘Īao Valley. 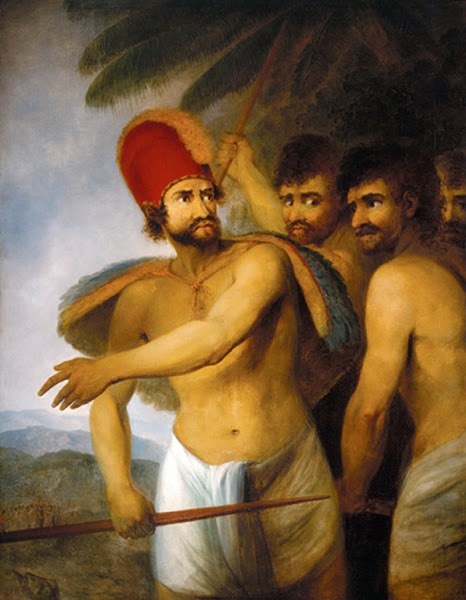 Maui Island was conquered and its fighting force was destroyed – Kalanikūpule and some other chiefs escaped over the mountain at the back of the valley and made their way to Molokaʻi, then to O‘ahu. With Kalanikūpule was Kalola, daughter of King Kekaulike, sister to Kahekili and aunt of Kalanikūpule. Kalola was also grandmother to Keōpūolani. Kamehameha camped on Molokai until Kalola died. This “capture” of the women by Kamehameha, a conquering chief taking the widow and female relatives of his defeated rival, was politically important. Taking Keōpūolani as his new wife, Kamehameha returned to Hawaiʻi Island. Kahekili decided that no better time could be chosen to attack Kamehameha. The chiefs had massed their forces on Maui. Here Kāʻeokūlani, took the leadership role. After a little rest, the Kauaʻi fleet swept across the channel and passed down the eastern side of Hawaiʻi. They ransacked villages along the way. Finally Kamehameha’s canoes and ships caught up with them off Waimanu, not far from Waipiʻo. In former years a naval battle meant the clash of canoe against canoe. This battle was different. The people on the bluffs saw the red flashes of the guns and noted the increasing noise of the artillery until they could no longer hear the voices of men. As the clouds of smoke crept over the sea the battle became, in the view of the watchers, a fight between red mouthed guns, and they shouted one to another the news of the progress of the conflict according to the predominance of flashing muskets and cannon. It was soon seen that the invaders were being defeated. The man who had the best arms and the best gunners won the victory. The Kauaʻi and Oʻahu Chiefs fled with their scattered fleets to Maui. The land moves like the turtle. 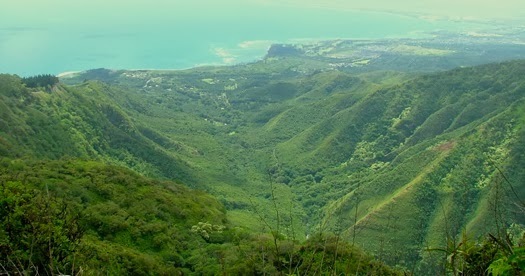 From its earliest period of occupation, the Waimānalo Bay region was an extensive agricultural area, featuring taro farms that used the traditional Hawaiian loʻi (pondfield) cultivation system. Taro was grown in the lowlands, irrigated with water from Waimānalo Stream, as well as on terraced sections that were watered by the small streams and springs flowing out of the Koʻolau Range. The village may have been depopulated during the early-1800s and probably was repopulated during the early-1850s when a disastrous smallpox epidemic struck Honolulu and Hawaiians settled temporarily in the Waimānalo Bay region to escape its ravages. Before we go there, let’s look at some findings of Dr Marion Kelly where she speaks of three main technological advances resulting in food production intensification in pre-contact Hawai‘i: (a) walled fishponds, (b) terraced pondfields with their irrigation systems and (c) systematic dry-land field cultivation organized by vegetation zones. The Hawaiian walled fishpond stands as a technological achievement unmatched elsewhere in island Oceania. Hawaiians built rock-walled enclosures in near shore waters, to raise fish for their communities and families. It is believed these were first built around the fifteenth-century. Samuel Kamakau points out that “one can see that they were built as government projects by chiefs, for it was a very big task to build one, (and) commoners could not have done it (singly, or without co-ordination. )” Chiefs had the power to command a labor force large enough to transport the tons of rock required and to construct such great walls. Kaiona Beach Park, a small four-acre park at the south end of Waimānalo Bay, is a popular camping site that has also been used for many years as a community boat anchorage. The green turtle is listed as endangered by the International Union for the Conservation of Nature. In 1978, the Hawaiian population of the green turtle was listed as threatened under the U.S. Endangered Species Act of 1973. NOAA Fisheries and the U.S. Fish and Wildlife Service (USFWS) have joint jurisdiction for green sea turtles. State and Federal laws prohibit harassing, harming, killing, or keeping sea turtles in captivity without a permit allowing these activities for research or educational purposes. Divers should be aware that riding turtles is illegal and puts these animals under stress. The image shows Pāhonu Pond in Waimānalo. In addition, I have added other images in a folder of like name in the Photos section on my Facebook and Google+ pages. On April 19, 1775, the Battles of Lexington and Concord were the first military engagements of the American Revolutionary War. The battles marked the outbreak of open armed conflict between the Kingdom of Great Britain and its thirteen colonies of British North America. In the Islands, over the centuries, the islands weren’t unified under single rule. Leadership sometimes covered portions of an island, sometimes covered a whole island or groups of islands. Island rulers, Aliʻi or Mōʻī, typically ascended to power through familial succession and warfare. In those wars, Hawaiians were killing Hawaiians; sometimes the rivalries pitted members of the same family against each other. In 1775, war between Hawaiʻi and Maui broke out at Kaupō on the island of Maui; it was the first battle that the rising warrior Kamehameha took part in. While Kalaniʻōpuʻu was at Hāna he sent his warriors to plunder the Kaupō people. Kahekili was king of Maui at that time, when Kahekili’s warriors met those of Kalaniʻōpuʻu at Kaupō, a battle developed between the two sides. Kalaniʻōpuʻu’s army was routed and retreated to their fleet, near at hand, and barely a remnant escaped on board and returned to Hāna. “Kamehameha, afterwards famous in history, (also) figured prominently in this battle as having gallantly supported Kekūhaupiʻo”. (Thrum) Despite the courageous fighting of Kamehameha and Kekūhaupiʻo along with the other Hawai‘i Island warriors, the massive Maui army of Kahekili eventually forces the Hawai‘i Island warriors to flee the battlefield. Kekūhaupiʻo was Kamehameha’s teacher in the ancient martial arts. Kekūhaupiʻo was determined to give all his knowledge to his chiefly pupil, and he indeed did so. This brought about the firm bond between Kekūhaupiʻo and the young Kamehameha. Kalaniʻōpuʻu promised revenge and, in 1776, he again went to battle against Kahekili. This battle (known as the Battle of Sand Hills or Ahalau Ka Piʻipiʻi O Kakaniluʻa) was recorded as one of the most bloody. Unfortunately, Kalaniʻōpuʻu was not aware of the alliance between Kahekili and the O‘ahu warriors under Kahahana, the young O‘ahu chief; Kalaniʻōpuʻu lost again. 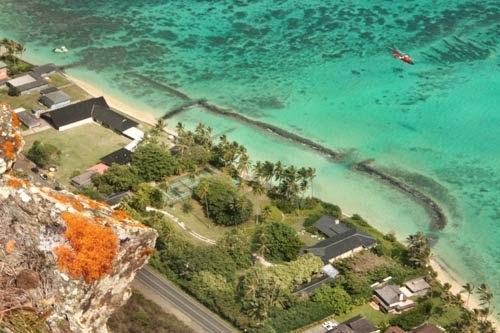 Although often defeated, Kalaniʻōpuʻu managed to hold the famous fort of Kaʻuiki in Hāna for more than twenty years. (Alexander) At the time of Captain Cook’s arrival (1778-1779,) Kalaniʻōpuʻu was the chief reigning over the Island of Hawaiʻi and Hāna, Maui. Kalaniʻōpuʻu returned to Hawaiʻi and met with Cook on January 26, 1779, exchanging gifts, including an ʻahuʻula (feathered cloak) and mahiole (ceremonial feather helmet.) Cook also received pieces of kapa, feathers, hogs and vegetables. After the departure of the Resolution and Discovery, Kalaniʻōpuʻu left the bay and passed to Kaʻū, the southern district of Hawaiʻi, having in his charge the young Kaʻahumanu. (Bingham) Kalaniʻōpuʻu died in 1782; Kahekili died in 1794. The image shows Kalaniʻōpuʻu, drawn by John Webber (1787.) I added a couple of other images in a folder of like name in the Photos section on my Facebook and Google+ pages. At the time of Captain Cook’s arrival (1778,) the Hawaiian Islands were divided into four kingdoms: (1) the island of Hawaiʻi under the rule of Kalaniʻōpuʻu, who also had possession of the Hāna district of east Maui; (2) Maui (except the Hāna district,) Molokaʻi, Lānaʻi and Kahoʻolawe, ruled by Kahekili; (3) Oʻahu, under the rule of Kahahana; and (4) Kauaʻi and Niʻihau, Kamakahelei was ruler. Kahahana left Maui and ruled Oʻahu. When war broke out between Kalaniʻōpuʻu of Hawaiʻi Island and Kahekili in 1779, Kahahana had come to the aid of Kahekili. Kahahana’s army was routed, and he and his wife fled to the mountains. For nearly two years or more they wandered over the mountains, secretly aided, fed and clothed by his supporters, who commiserated the misfortunes of their former king. Weary of a life in hiding, Kahahana sent his wife, Kekuapoʻiʻula, to negotiate with Kekuamanohā (her brother, and chief under Kahekili) for their safety. Kekuamanohā sent messengers to Kahekili at Waikīkī informing him of the fact. Kahekili immediately ordered the death of Kahahana, and he sent a double canoe down to ʻEwa to bring the corpse to Waikiki. This order was faithfully executed by Kekuamanohā. Kahahana and Alapaʻi were killed in Waikele. Some of the remaining Oʻahu chiefs sought revenge and devised a wide-spread conspiracy against Kahekili and the Maui chiefs. The conspiracy was led by Elani, father of Kahahana and included a number of Oʻahu chiefs. At the time, Kahekili and his chiefs were quartered in various areas around the island. Kahekili was in Kailua, while others were in Kāneʻohe and Heʻeia, and the remainder in ʻEwa and Waialua. The plan was to kill the Maui chiefs on the same night in the different districts. The streams of Makaho and Niuhelewai in Kona (Oʻahu,) and that of Hōʻaeʻae in ʻEwa, were said to have been literally choked with the corpses of the slain. The Oʻahu aristocracy had almost been entirely killed off. In Europe, Great Britain defeated France in the Seven Years’ War (1756-1763,) becoming the dominant power in Europe, North America and India. The war cost a lot of money; to raise funds Britain decided to levy taxes on the Colonies on the American continent. Turmoil was in the Islands, as well – some folks on Maui were also feeling that they were not being treated fairly; in addition, a power struggle was emerging. Nāmāhana’s brother, Kahekili, then became King of Maui, was displeased that Nāmāhana had taken Keʻeaumoku for her husband, and he became Keʻeaumoku’s enemy. Nāmāhana and Keʻeaumoku lived at the large and fertile land of Waiheʻe. Some people on Maui felt that the abundance of resources would have allowed all to be well fed; they felt they were not getting their share. One evening Kahanana killed three of Keʻeaumoku’s men. An insurrection arose and Kahekili, who was in the vicinity, took the side of Kahanana. 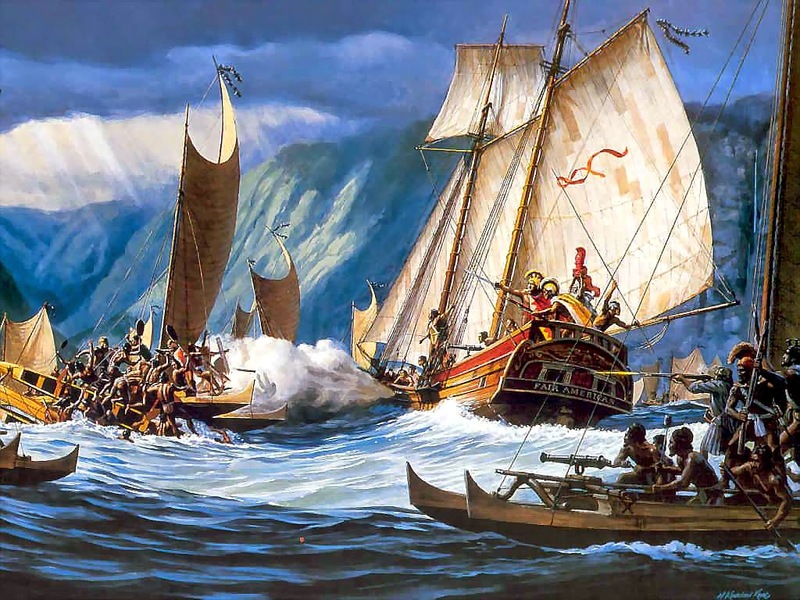 The resultant Battle of Kalaeʻiliʻili (c. 1765) was fought because the rich agricultural resources of the Waiheʻe River Valley and the offshore marine resources were being unevenly distributed by the chief Keʻeaumoku and other Molokaʻi chiefs. The Battle reportedly marked the beginning of Kahekili’s reign and Keʻeaumoku and the Molokaʻi chiefs were driven out of Waiheʻe. It was later, there at Kaʻuiki, Hāna, Maui, in about 1768, that Keʻeaumoku and his wife Nāmāhana had their first child, Kaʻahumanu, future and famous Queen of Kamehameha the Great. Back on the continent, the discontent between the Colonists and the British Crown led to the American boycott of taxed British tea and the Boston Tea Party in 1773, and ultimately the American Revolutionary War (1775–1783) and then the War of 1812. The image shows Waiheʻe Valley from Waiheʻe Ridge Trail. In addition, I have included other related images in a folder of like name in the Photos section on my Facebook and Google+ pages.